Set amidst the picturesque scenery of Bardowie Castle at Bardowie Sailing Club, Bardowie, Milngavie. There is free car parking facilities within the Clyde Cruising Club car park at Bardowie. Please note however that this is not a large car park so car sharing where possible would be appreciated. Bardowie Loch, Off Craigmaddie Road, G62 6EX. Once you have arrived on-site make your way to the registration desk area, this will be located in the Club House where our event team will complete your registration and answer any questions you may have. At registration each competitor will be body marked and receive a swim hat, your swim hat must be worn outermost during the duration of the swim. The timing will be provided by our partner company Racesplitter, there is no need for a chip timer. On race day both competitors and spectators are advised to park in the designated areas only. Registration will be open from 7.30am, only competitors and officials will be allowed access. Verbal briefings from race organisers will take place at 8.40am. 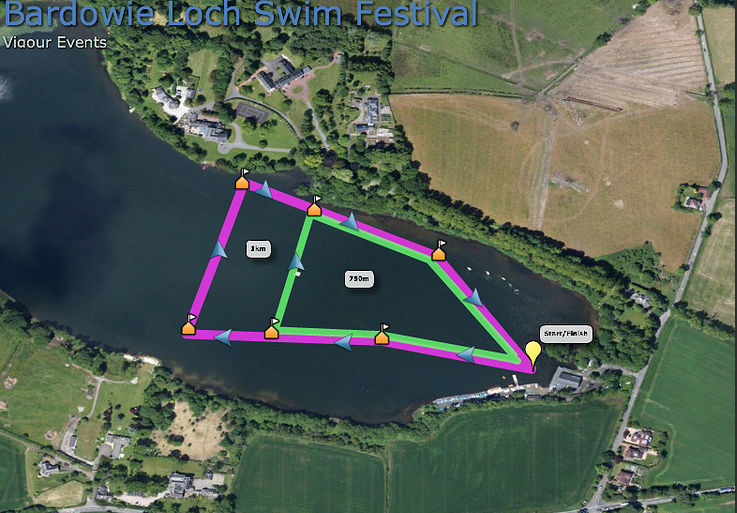 All competitors must be within registration area at this time, they will be registered with our Racesplitter timing team and a roll call count will take place to ensure your understanding of the swim layout, distances and procedures. Canoe & Kayak lifeguards and powered safety boats will provide safety cover. Toilets and changing facilities are available inside the Club House. 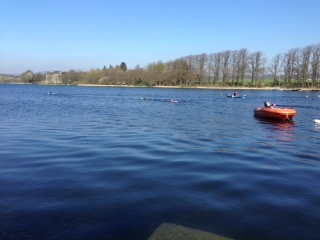 Buoys on the loch will mark courses. The courses and details of the starts and finishes are shown on the following diagrams. Any changes to the courses will be notified at the briefing. Spectators are welcome to come along and watch the event and cheer the competitors on, please be mindful of competitors and where necessary step out of the way of oncoming swimmers. Bring warm clothes with you to ensure that you stay warm and dry after the event. Ensure that you re-hydrate and fuel properly.